^ "TWIP is now Landolia". twip.org. Archived from the original on 2011-09-18. Retrieved 2011-11-02. ^ Yussef Bazzi. "Martyrs' Square, a Short History of Lebanon". eng.babelmed.net. Archived from the original on 2012-04-04. Retrieved 2011-11-02. ^ "Architecture - Beirut Exhibition Center". 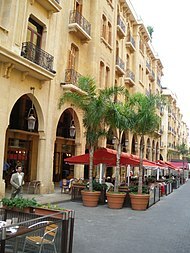 beirutexhibitioncenter.com. Archived from the original on 2013-01-21. Retrieved 2012-11-22.